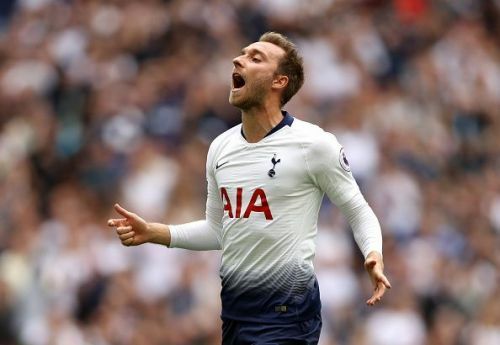 Dropping off between the lines; playing delicious through balls; unlocking defences with pinpoint, well-timed passes; dropping into space and shooting accurately from acute angles; Christian Eriksen is that exceptionally skilled technician the seven emperors of ancient Rome would have paid to watch at the Colosseum. Two times Tottenham went behind, two times Tottenham restored parity. 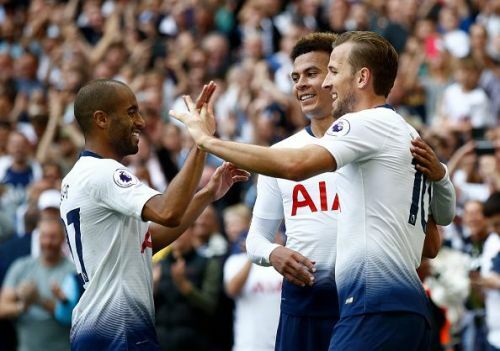 First Harry Kane heading in a perfect cross to cancel out Willian's spectacular free-kick, then Dele Alli latching onto a defense-splitting through ball to pull Spurs level again, but the source of creation was one and the same. It was the 2016/17 Emirates FA Cup Semi-final clash between league rivals Chelsea and Tottenham; While Willian Borges ran the show for Conte's men early on, Christian Eriksen's unerring genius opened Chelsea up and kept Spurs in it. But for Antonio Conte's timely introduction of Eden Hazard and Diego Costa, The Dane almost literally dragged the semi-final away from Chelsea; in stages, never hurried, just steadily asserting his craft via a series of diabolic through balls and pin-point passes between the lines. The claim that Eriksen is the beating heart of Tottenham's high pressing attacking system seems logical, except it's more than that, Eriksen is the very system; when he plays well, life becomes easier for Harry Kane, Dele Alli and Son Heung-Min, but when he struggles, the goals are hard to come by and it's not surprising that the recurring priority for opponents is almost always interrupting his flow. In 2010, 18-year-old Eriksen was the youngest player at the World Cup, but his rapid development is a testament to why he came into the 2018 World Cup as one of the best attacking midfielders in the World; It's hard to imagine how Denmark could have qualified without his services. "He was the best player from the start but he'd never say it"
"More than that, he was the guy who took care of all the others"
That last line sums it all up. In 2017/18, only Kevin De Bruyne (41) and Alexis Sanchez (29) completed more through balls than Eriksen (24), and only Manchester City's trio of De Bruyne, Raheem Sterling and Leroy Sane had more assists than Eriksen (10). Last season, Eriksen completed 1545 passes, with a pass accuracy of 80%; 71% were forward passes; his numbers in the final third provide evidence for his untouchable status as Tottenham's architect in chief, but it also highlights the fact that his genius, although the most important element of Tottenham's attacking offensive, doesn't get all the credit it deserves; maybe he needs to do more. Like most attacking supremos, there's a weakness to Eriksen's genius. His occasional habit of letting the ball speak, very minimal aggression, relaxed playmaking, and a worrisome dose of passivity often makes it easier for opponents to keep him quiet for long periods. Perhaps it's why Kevin De Bruyne's game remains a notch above Eriksen's. The Belgian's application of "fire and brimstone" when necessary and his ability to dictate games in his explosiveness is in complete contrast to the often subtle and less aggressive approach of the Danish playmaker. Following a Euro 2016 qualifying defeat by Portugal back in 2014, former Denmark coach Morten Olsen devised a carefully calculated reproach to make the player sit up, citing "his inability to control games and that this was not Ajax anymore" where relaxed playmaking was the order of the day. Twenty international caps later, just before the World Cup in Russia, the former Ajax man had notched 15 goals, three of which was the hat-trick against the Republic of Ireland that helped Denmark qualify for the FIFA World Cup. Fortunately, what he lacks in brute force, he makes up for defensively; often deployed as an attacking or central midfielder, Eriksen rarely puts a foot wrong, but perhaps, another commendable aspect of his game is his ability to contribute as much when Tottenham do not have the ball. The 26-year-old has an overall Premier League tackle success rate of 75%, over 100 blocked shots, 942 recoveries, and 95 clearances. The Dane's approach to the game is hardly physical, but his accurate reading of the game often makes his defensive responsibility less complicated than it has to be. Eriksen has now reached 25 goals for the Danish national team, and his goalscoring rout on International duties is not unconnected to the fact that Denmark is lacking in the attacking department; something Tottenham have in abundance. Denmark's style under Age Hareide is designed to put Eriksen in areas where he can hurt opponents to a degree none of his peers can match. But as the fulcrum of Mauricio Pochettino's dynamic high-pressing pack, what Eriksen often does is split the defence and unsettle opponents with metronomic passing and timely through balls; or alternatively, make the net bulge with inch-perfect dead-ball deliveries. As far as the World Cup is concerned, Eriksen was both hero and villain for Denmark, scoring the hat-trick that sent them to Russia, and then alongside Lasse Schone and Nicolai Jorgensen, fluffing his lines in the Round of 16 penalty shoot-out loss to Croatia. Then the UEFA Nations League arrived, an opportunity for redemption, and of course, Eriksen duly obliged; His swift, surgical and unforgiving display at Ceres Park helped Denmark to a 2-0 defeat of Wales. The win and Eriksen's man of the match performance was the ultimate reality check for the Welsh, but it was a sign that the Middlefart playmaker could be taking his game up another notch this season. At 26, Christian Eriksen's twilight years are not upon him, and while the latter stages of his brilliant career unfold in phases, it is the appetite, aggressiveness and mental composition required to thrive at and beyond the peak of one's powers, that will earn him a seat in the hallowed chambers of midfield supremos.